Really quick sketch today. This took me about 10 minutes. I really HATE landscapes or anything where people aren’t the main focus, so this was a challenge for me. 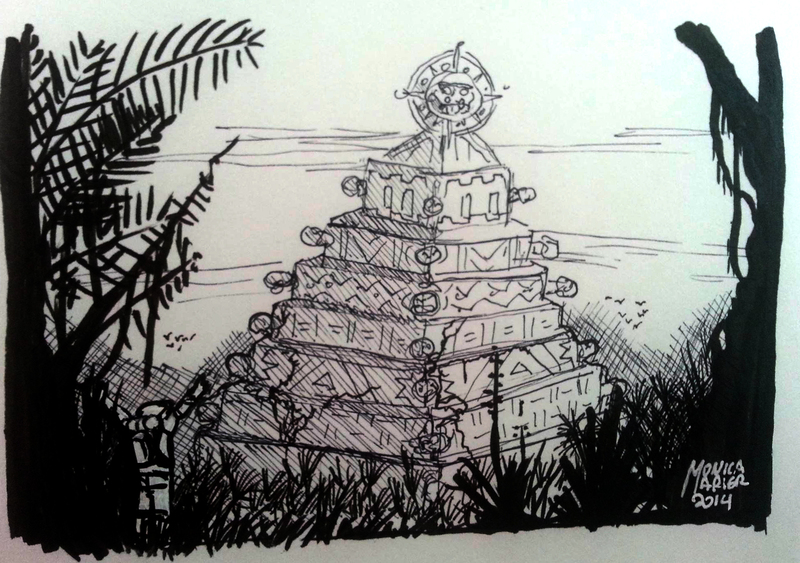 I woke up this morning with Genesis’ “Trick of the Tale” running in my head, so I decided to draw the “City of Gold” in the song. I was also remembering that old cartoon series on Nickelodeon at the time and drawing in my memories of Teotihuacan when I visited it in highschool. I had some trouble with the figure in the foreground. He started out a black sillouhette but he became overshadowed by the foliage, so I tried to go over him again with white pen. I’m not sure whether I fixed it or made it worse, but I ran out of time, and decided to jut let it be. I’m proud of how the landscape came out in any case and I’m happy that the fine liner and the brush pen isn’t such a stranger to me anymore. Here’s the Genesis song, if you want to hear it.